If you’d like to make use of the flat InfoCube support, but you found it too cumbersome to convert all your standard InfoCubes to flat InfoCubes one by one using program RSDU_REPART_UI, then here’s good news for you: Program RSDU_IC_STARFLAT_MASSCONV can start and monitor this conversion for many InfoCubes with just a few clicks. InfoCubes with inventory data can have requests that contain historic inventory data (history transaction data). Make sure that you compress these requests before you start the conversion. Ensure that you have a recent database backup. Start the conversion program as follows: Call the ABAP editor (transaction SE38) and execute program RSDU_IC_STARFLAT_MASSCONV. Confirm the popup asking whether you have done the backup and compression. At the first start of RSDU_IC_STARFLAT_MASSCONV, the work list is empty. Select button (Re-)Generate Work List to create it. A background job named RSDU_IC_FLAT_MASSCONV_BTC is started that collects information about all InfoCubes in the system – if they are standard InfoCubes or already flat InfoCubes, whether they can be converted, or why not, and how large they are to help estimate the effort needed to convert them. With the button Work List Generation: Job Overview, you can navigate to the job overview (transaction SM37) to check the job. Once the job is finished, you can display the newly created work list using button Refresh Display of Work List. Non-Convertible InfoCubes: Standard InfoCubes that cannot be converted to flat. The screen also shows the reason why a conversion is not possible. Convertible InfoCubes: Standard InfoCubes that can be converted to flat. Flat InfoCubes: InfoCubes that have already been created as flat InfoCubes, or that have finished the conversion successfully. Conversion Jobs: InfoCubes that have been scheduled for conversion, together with name, status, and further information about the conversion job. On tab page Convertible InfoCubes, select all InfoCubes that should be converted to flat InfoCubes, then press button Schedule Conversion. 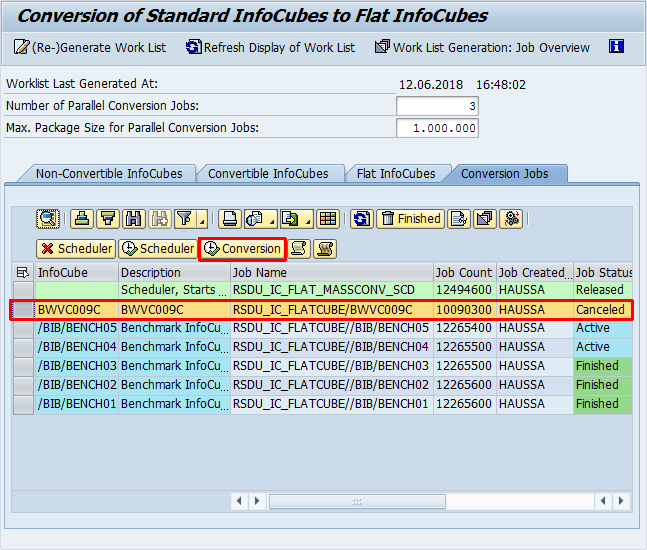 The program initializes a conversion request and schedules a conversion job named RSDU_IC_FLATCUBE/<InfoCube name> for each selected InfoCube. The InfoCubes are moved to the Conversion Jobs page. With the button Update Job List, you can refresh the tab page to track the progress of the conversion jobs. 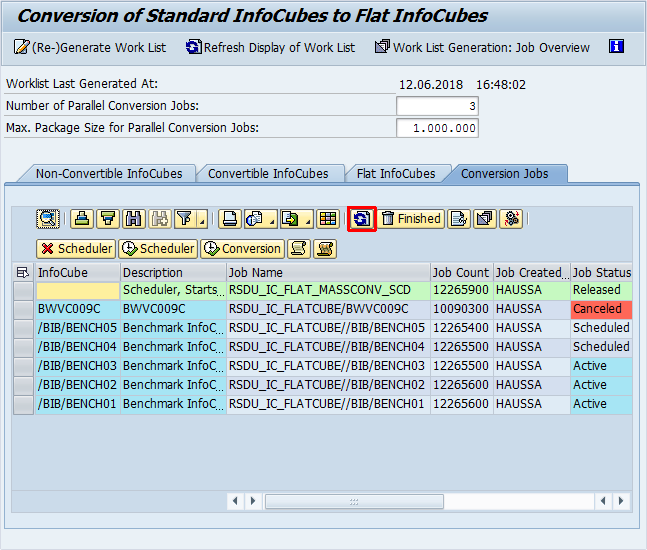 When a conversion has been finished successfully, the converted InfoCube is added to the Flat InfoCubes tab page. Please note that this program is not intended for converting many very large InfoCubes in parallel. During the conversion process, additional storage space of about the same size that the InfoCube occupies is temporarily needed. When converting too many large InfoCubes at the same time, storage space might run out. The parameter Number of Parallel Conversion Jobs controls the number of conversions that can run at the same time. Together with the conversion jobs, a scheduler job named RSDU_IC_FLAT_MASSCONV_SCD is created that periodically compares the number of running conversions with this maximum and releases waiting conversion jobs if possible. When scheduling conversions, a popup asks you for the job start time, and you can set it to Immediate Start (this is the default) or a certain date and time. Ensure that the option Periodic Job is selected. If you deselect this option, the scheduler job will not be started. 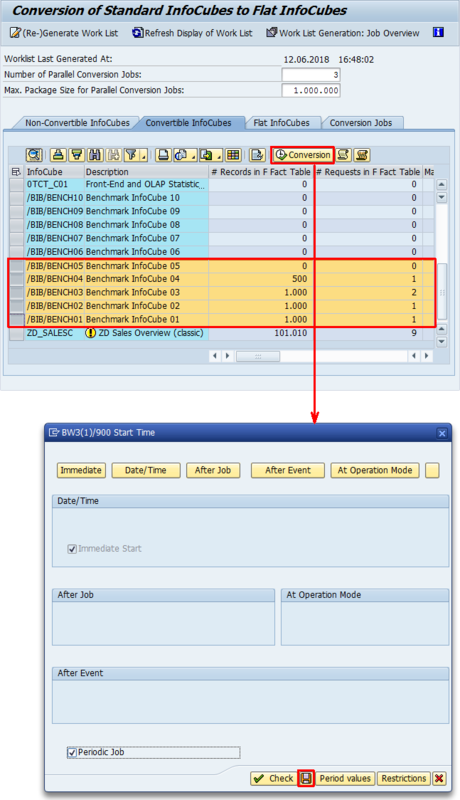 The periodic interval at which the scheduler job should run is set to the default value of 3 minutes, but you can change it to any time period between 1 minute and 99 months. If the scheduler job is started, an entry for the scheduler is displayed in the job list on the Conversion Jobs page. Once all scheduled conversion jobs have been released, the scheduler job deletes itself automatically. If a conversion job was aborted, check the available logs for the reason (see also chapter Troubleshooting). Once the issue has been resolved, you can restart the conversion job to continue/retry the InfoCube conversion. To reschedule a conversion job, select the aborted job on tab page Conversion Jobs and press button Reschedule aborted Conversion Jobs. If an InfoCube that you want to convert is listed as non-convertible, check the reason and correct it. Then regenerate the work list. If the issue was removed successfully, the InfoCube should now appear on the Convertible InfoCubes tab page. You can regenerate the work list at any time, even while conversions are running. Please be aware that only unfinished conversions (scheduled, active, aborted jobs) will be listed on the Conversion Jobs tab page. Successfully finished jobs are removed from the list. On the tab pages, there are several buttons to navigate to different logs and overview pages to identify issues with the conversions. 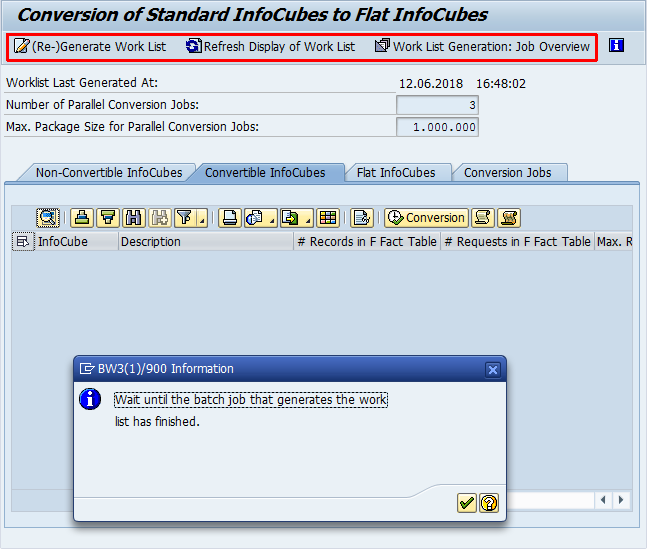 Navigates to the Job log overview for the conversion job of the selected InfoCube (transaction SM37 -> Display job log). It contains information about the job steps, and messages that the conversion program may have issued. Navigates to the Application log (transaction SLG1) and displays messages from the scheduler. It contains information about which conversion jobs were scheduled when, when they were actually released, and when the scheduler job was started and deleted. It also contains error messages if there were issues with initializing conversion requests, or with creating or starting the conversion jobs. Navigates to the InfoCube conversion monitor (transaction RSCNV_MONITOR) and displays the logs for the conversion of the selected InfoCube. It contains information about the different conversion steps, what was done in each step, and whether errors occurred. Navigates to the Job Overview (transaction SM37) and displays all conversion jobs for the selected time frame. 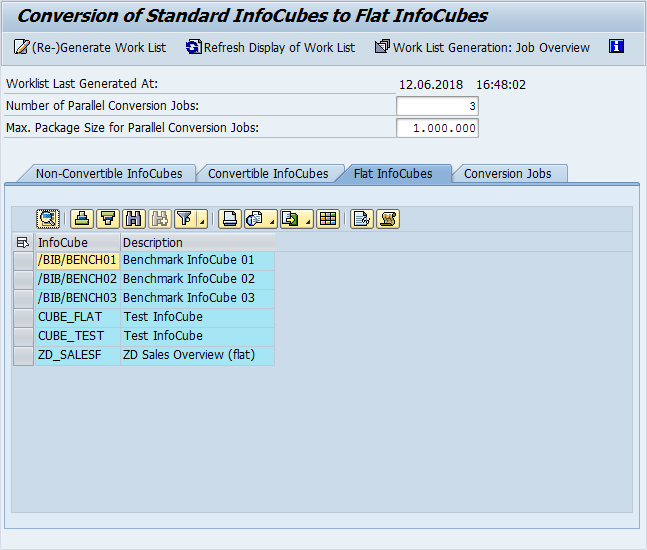 If you select an InfoCube, only the conversion jobs for this InfoCube are displayed. Navigates to the Work Processes Overview (transaction SM66) where you can check whether other long-running work processes slow down the system. In contrast to transaction SM50, which only shows the work processes of the current application server, transaction SM66 shows the work processes of all active application servers of the system. In case there is an issue with releasing scheduled conversion jobs, the scheduler can be stopped manually, and after the issue has been resolved, it can be restarted again with the buttons Stop Scheduler Job and Start Scheduler Job on the Conversion Jobs tab page. Please note that if you stop the scheduler while there are still scheduled conversion jobs, you have to restart the scheduler again at some time, or the waiting conversion jobs will never be started. The button Help on the main toolbar points you to SAP Note 2446889. Attached to this SAP Note is a document with a detailed description of the program RSDU_IC_STARFLAT_MASSCONV. 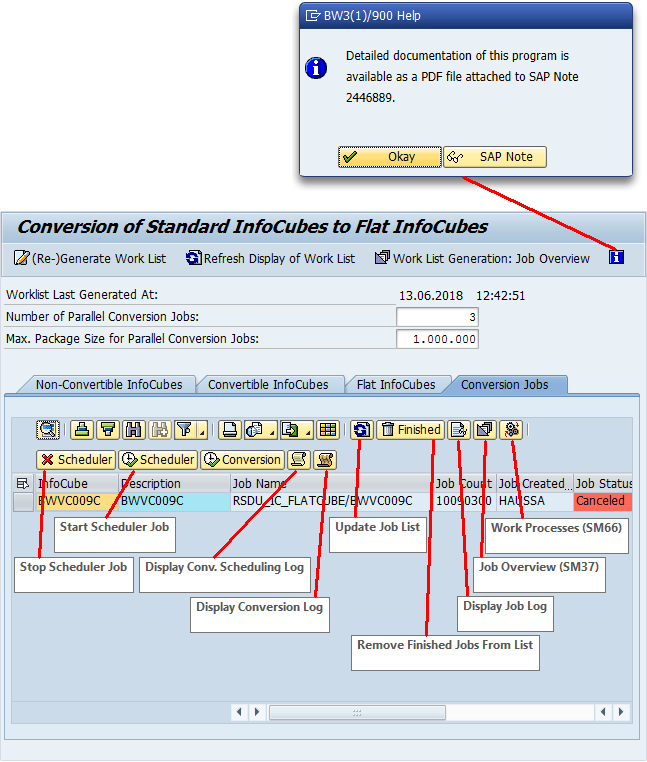 The program RSDU_IC_STARFLAT_MASSCONV has been delivered with SAP Note 2446889 – Mass Conversion of Star InfoCubes to Flat InfoCubes. The note lists the database platforms that support mass conversions of standard InfoCubes to flat InfoCubes with this program. With SAP Note 2634508 – Enhance Report RSDU_IC_STARFLAT_MASSCONV, the program was significantly enhanced for all supported platforms, and it now also runs on SAP NetWeaver BW systems on IBM i. The Support Packages listed in SAP Note 2634508 will be available to customers in summer/fall 2018, but the changes are available now by applying the SAP Note to your system.